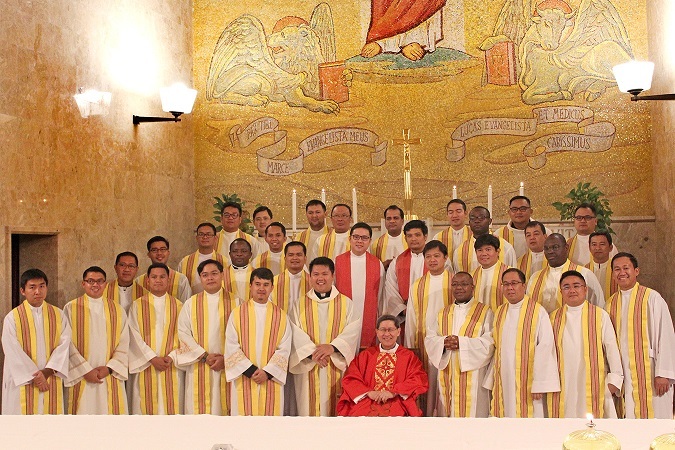 The Collegio is currently home to 25 student priests from the different Philippine dioceses. Another 7 priests live with us, who come from Camerun, India, Kenya (3 Priests), Nigeria, and Thailand. Collegio alumni may be assigned anywhere in their home dioceses. Many serve as seminary formators or professors, to train the future generations of Priests, or as members of the Diocesan Curia (Vicars General, Judicial Vicars, Chancellors, Bishop’s Private Secretaries, etc), or in specialized ministries such as the mass media or school systems. Still others have been assigned to parishes abroad, to the Vatican Curia, the Diplomatic Service of the Holy See, or the Apostolic Nunciature in Manila. In these cases, the home dioceses make a very generous contribution to the Universal Church. The Collegio accepts only priests formally sent by their respective Bishops to do further studies in Rome. While preference is given to Filipino diocesan priests, other priests may also apply on a case to case basis, and space permitting. The Collegio has always welcomed guests visiting us for Mass or prayers, a Filipino meal, or just to chat and enjoy the family atmosphere of this Filipino “Home in Rome”. Our friends continue to be united with us through their prayers, encouragement and material support. We also include them in our daily intentions, especially in the Holy Sacrifice of the Mass. Three Administrators coordinate the Collegio‘s day to day activities: a Rector, a Vice-Rector/Economus, and a Spiritual Director. Four Filipina Dominican Sisters (OP’s of the Congregación Misionaria de Santo Domingo) help as support staff of our Pontifical College. They are assisted by three four personnel. Fr. Greg is a priest of the Archdiocese of Manila. A native of Silay City, Negros Occidental, he studied at the Philippine Science High School and the University of the Philippines (BS Zoology and two years Medicine proper) before deciding to become a priest. The late Jaime L. Cardinal Sin sent him for seminary formation to Pamplona, Spain, and to do the Licentiate and Doctorate in Moral Theology at the Angelicum in Rome. He served in Manila as assistant parish priest, seminary formator and in other assignments, and as an Official at the Pontifical Council for the Family of the Vatican. Msgr. Rey hails from the Diocese of Alaminos in Pangasinan. He obtained his Licentiate in Canon Law from the Pontifical Gregorian University in Rome, after which he served, among others, as Judicial Vicar, Parish Priest of the Cathedral, and Diocesan Administrator. Fr. Andrew is a diocesan priest of the Archdiocese of Caceres in Naga City, Bicol region, Philippines. He is an alumnus of Pontificio Collegio Filippino (2000-2002: Licentiate in Missiology; 2006: Doctorate in Missiology, Pontifical Gregorian University). Also, he holds an M.A. in Moral Theology (1996, Divine Word Seminary, Tagaytay City) and an MBA (2008, Ateneo de Naga University). He held the following positions of service: Professor (Missiology and Ecclesiology: 2002-2012) at the Holy Rosary Major Seminary in Naga City; visiting professor (Missiology, Mariology and Globalization Studies: 2004-2017) at the Divine Word Seminary, Divine Word Institute of Mission Studies, Tagaytay City, San Carlos Seminary, Manila and St. Vincent School of Theology, Quezon City; past president of the International Association of Catholic Missiologists (2012-2017); member of the CBCP’s Philippine National Missionary Council (2004 – present); past director of the Center for the Spirituality of Communion, Tagaytay City (2014-2017); and former parish priest of the Penafrancia Old Shrine, Naga City (2011-2014): Mission Director (2002-2012).